During the second week of September 2013, nearly continuous rainfall caused widespread landslides and flooding in the northern Colorado Front Range. The combination of landslides and flooding was responsible for eight fatalities and caused extensive damage to buildings, highways, and infrastructure. Three fatalities were attributed to a fast moving type of landslide called debris flow. One fatality occurred in Jamestown, and two occurred in the community of Pinebrook Hills immediately west of the City of Boulder. All major canyon roads in the northern Front Range were periodically closed between September 11 and 13, 2013. Some canyon closures were caused by undercutting of roads by landslides and flooding, and some were caused by debris flows and rock slides that deposited material on road surfaces. Most of the canyon roads, with the exceptions of U.S. Highway 6 (Clear Creek Canyon), State Highway 46/Jefferson Co. Rd. 70 (Golden Gate Canyon), and Sunshine Canyon in Boulder County, remained closed at the end of September 2013. A review of historical records in Colorado indicates that this type of event, with widespread landslides and flooding occurring over a very large region, in such a short period of time, is rare. 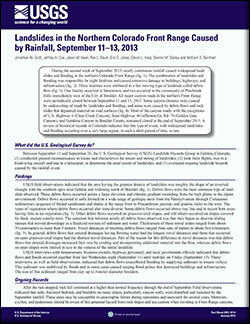 Godt, J.W., Coe, J.A., Kean, J.W., Baum, R.L., Jones, E.S., Harp, E.L., Staley, D.M., and Barnhart, W.D., 2014, Landslides in the northern Colorado Front Range caused by rainfall, September 11–13, 2013: U.S. Geological Survey Fact Sheet 2013–3114, 6 p., https://dx.doi.org/10.3133/fs20133114. What did the U.S. Geological Survey do?